A new thyssenkrupp elevator has taken home the Gold award in the Transportation and Logistics category at the 2017 Edison Awards, announced recently in New York. 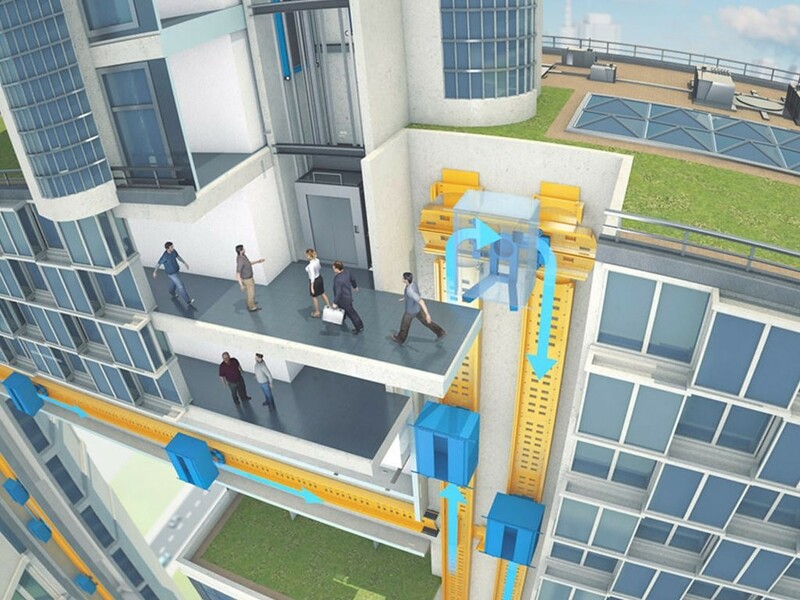 thyssenkrupp’s MULTI elevator, the world's first rope-free elevator system, leverages linear motor technology to move multiple elevator cars in a single shaft both vertically and horizontally. The system signifies an unprecedented optimisation of vertical passenger transportation. Representing a new era in urban mobility, thyssenkrupp’s MULTI elevator addresses the need for a flexible transport system for skyscraper buildings, similar to the Metro. Efficient mobility, especially in tall buildings, is an absolute necessity. In this sense, MULTI is a true example of innovation. Stepping away from traditional, rope-driven elevator technology, MULTI combines revolutionary linear motor technology with a simple operational concept and passenger convenience. It opens the door, so to speak, to design possibilities in all directions. Markus Jetter, head of product development at thyssenkrupp and the chief engineer of the new product, says that MULTI heralds the end of the 160-year reign of the rope-dependent elevator, and marks the beginning of a new era for the elevator industry. According to Mr Jetter, the evolving nature of building construction requires elevator systems to adapt to better suit the requirements of buildings and high passenger volumes. thyssenkrupp believes that MULTI will transform the way people move inside buildings, reducing waiting times for passengers and taking up significantly less space. The rope-free technology of thyssenkrupp’s MULTI elevator delivers multiple benefits for building owners, architects and passengers. Designed to increase passenger shaft capacity by 50 per cent, MULTI requires smaller shafts than conventional elevators, and can increase a building’s usable area by up to 25 per cent. By consolidating multiple cabins into fewer shafts, the elevators’ footprint is reduced by 50 per cent. The lower requirement for escalators and additional elevator shafts results in significant construction cost savings as well as higher rent revenues from increased usable space. Recent advances in lightweight design including lightweight carbon composites have been integrated to reduce MULTI’s cabin and door weight by up to 50 per cent. Elimination of ropes and counterweights additionally decreases the mass of the elevator system. Of course, safety continues to be prioritised by thyssenkrupp. MULTI’s cabins feature a multi-propulsion and braking system along with the proven safety control system of their TWIN elevator to ensure passenger safety. The new technology will help architects break free from building height restraints and shape limitations, as well as concerns about elevator shaft height and vertical alignment. Passengers also gain from the reduced waiting times; with MULTI’s multiple cabins in a single shaft, passengers need not wait more than 15 to 30 seconds for a ride. An annual competition honouring excellence in new product and service development, marketing, human-centred design and innovation, the Edison Awards program is named for famed innovator Thomas Alva Edison. The Edison Award is one of the most prestigious accolades a company can receive for innovation and business success. This year’s nominees were judged by a panel of over 3,000 business executives, including past award winners, academics, and leaders in the fields of design, engineering, science, and medicine.